Is the Environmental Movement on the Wrong Track? Editor’s Note: Below is a review by David Morris of the book, Break Through by Ted Nordhaus and Michael Shellenberger. In the spirit of debate, following the review is a response from the authors and a rebuttal from Morris. In 2004, Ted Nordhaus and Michael Shellenberger tossed a stink bomb into the normally collegial annual meeting of the Environmental Grantmakers Association in the form of a jeremiad against the premises and strategies of the environmental movement, The Death of Environmentalism. The succeeding months witnessed a spirited and often heated back and forth between the authors and environmental leaders. How much energy could be generated by states tapping into internal renewable resources? 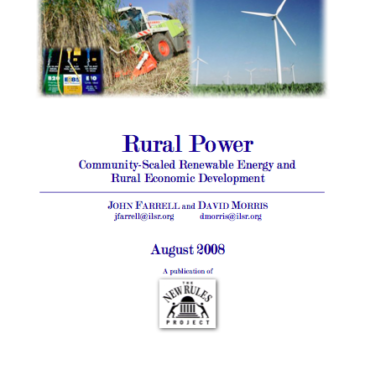 This November 2008 report by David Morris and John Farrell presents preliminary data that suggests that at least half of the fifty states could meet all their internal energy needs from renewable energy generated inside their borders, and the vast majority could meet a significant percentage. This August 2008 report by David Morris and John Farrell was sponsored by the Ford Foundation. The next 20 years could generate as much as $1 trillion in new renewable energy investment in rural America. 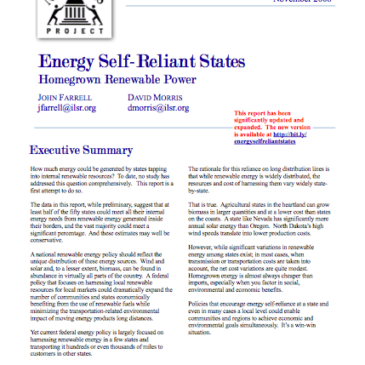 The report is a policy roadmap for states and the federal government that would redesignpolicies to encourage a highly decentralized and dispersed renewable energy industry that is significantly locally owned. 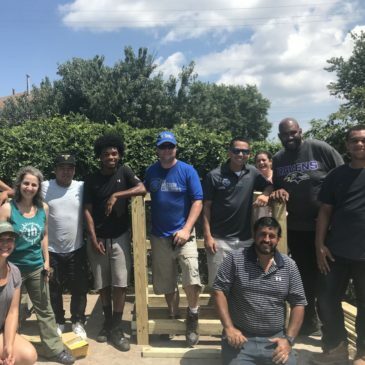 Doing so would multiply the number of rural areas that benefit from burgeoning renewable energy industries, and would create a sustainable asset whose wealth and revenue will largely remain in revived local communities and regions. This June 2008 policy brief by Justin Dahlheimer concludes that states could generate hundreds of millions, in some cases billions, of dollars in additional revenue each year by implementing or adjusting depletion tax policies. The report illustrates how current depletion tax policies, in many cases, fail to account for the full value of the natural resources, depriving state and local governments of additional revenue that could be useful in current and future fiscal years. This February 2008 report by David Morris criticizes the authors of two recent studies published in Science for advancing a conclusion not supported by their own studies. The paper notes that the vast majority of today’s ethanol production comes from corn cultivated on land that has been in corn production for generations. 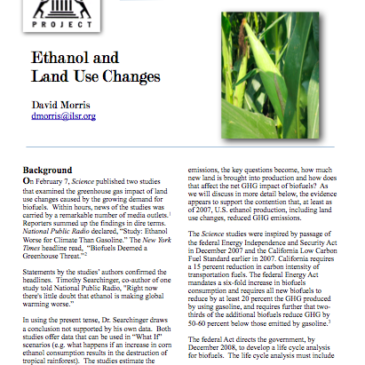 Since little new land has come into production, either directly or indirectly, the current use of ethanol clearly reduces greenhouse gas emissions.